Atlantis� retractable ballpoint pen is the trusted original for a classic look and feel. Writes smoother than the classic ink system. 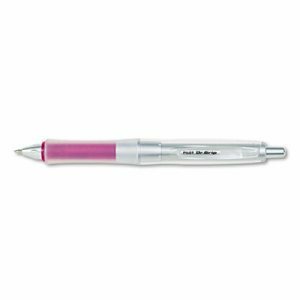 It is an everyday, smooth-click retractable ball pen with a comfortable rubber grip and metal clip. Point Size: 1 mm; Point Type: Medium; Ink Color(s): Pink; Pen Type: Ballpoint. Designed with perfect weight distribution for comfortable, balanced writing. Geometrically contoured, wide double-layer grip and balanced gripping axis reduce writing stress and alleviate hand fatigue. Ink is extra long-lasting and provides an ultra-smooth writing experience. Recommended for Ease-of-Use by the Arthritis Foundation�. Silver-toned barrel with colored grip and metal accents. Retractable and refillable for continued use. Point Size: 1 mm; Point Type: Medium; Ink Color(s): Black; Pen Type: Ball Point. Indulge yourself with the smooth comfort of this delightfully designed Dr. Grip Frosted advanced ink pen. Light and airy pastel barrel colors. All come with black ink and the most popular medium point size. The ergonomic cushioned grip alleviates writing stress while the advanced ink glides on the page. Point Size: 1 mm; Point Type: Medium; Ink Color(s): Black; Pen Type: Ballpoint.